The West Memphis Three. Accused, convicted…and set free. Do you know their story? In 2011, one of the greatest miscarriages of justice in American legal history was set right when Damien Echols, Jason Baldwin, and Jessie Misskelley were released after eighteen years in prison. 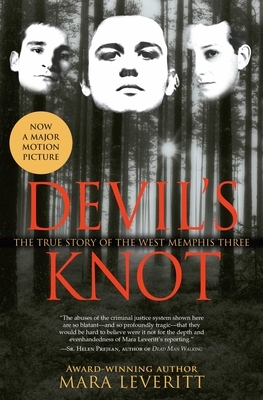 Award-winning journalist Mara Leveritt’s The Devil’s Knot remains the most comprehensive, insightful reporting ever done on the investigation, trials, and convictions of three teenage boys who became known as the West Memphis Three. For weeks in 1993, after the murders of three eight-year-old boys, police in West Memphis, Arkansas seemed stymied. Then suddenly, detectives charged three teenagers—alleged members of a satanic cult—with the killings. Despite the witch-hunt atmosphere of the trials, and a case which included stunning investigative blunders, a confession riddled with errors, and an absence of physical evidence linking any of the accused to the crime, the teenagers were convicted. Jurors sentenced Jason Baldwin and Jessie Misskelley to life in prison and Damien Echols, the accused ringleader, to death. The guilty verdicts were popular in their home state—even upheld on appeal—and all three remained in prison until their unprecedented release in August 2011. With close-up views of its key participants, this award-winning account unravels the many tangled knots of this endlessly shocking case, one which will shape the American legal landscape for years to come. Mara Leveritt has won several awards for investigative journalism, including Arkansas's Booker Worthen Prize for her book The Boys on the Tracks. A contributing editor to the Arkansas Times, she lives in Little Rock. "Brutal, riveting....The true horror of Leveritt's well-written book is that this barely believable fate could potentially befall any American." "The abuses of the criminal justice system shown here are so blatant—and so profoundly tragic—that they would be hard to believe were it not for the depth and even-handedness of Mara Leveritt's reporting." "Devil's Knot becomes the best horror novel you've ever read, one of those that leaves you wondering what new sick dread might be lying in wait on the next page...The monster Leveritt reveals in the end, however, is more terrifying than even the fork-tailed boogeymen conjured by West Memphis police and prosecutors to fit their crime. What Leveritt reveals to us is the most horrible fiend a rational person can imagine when matters of life and death are at stake: the Specter of Doubt." "The chronology [of Devil's Knot] is the first time all elements of the case have been assembled in one narrative, which offers surprises, even for those familiar with the events. As such, it is a true public service." "An affecting account of a controversial trial...Leveritt's carefully researched book offers a riveting portrait of a down-at-the-heels, socially conservative rural town with more than its share of corruption and violence." "Well written in descriptive language, Devil's Knot is an indictment of a culture and legal system that failed to protect children as defendants or victims. Highly recommended."